►BENEFITS-Jade roller and gua sha stone have many benefits for our body and our skin,the roller can promote the blood circulation,reduce puffiness and wrinkling,Help absorb the nutrients and ingredients when applying mask or before bed with your face serum,help improve complexion, fight the effects of aging, revitalize your skin, reduce pigmentation, and helps fight acne, along with detoxifying the body,Make you look young and beautiful. ►DOUBLE-HEAD DESIGN- with a big roller and a small roller. 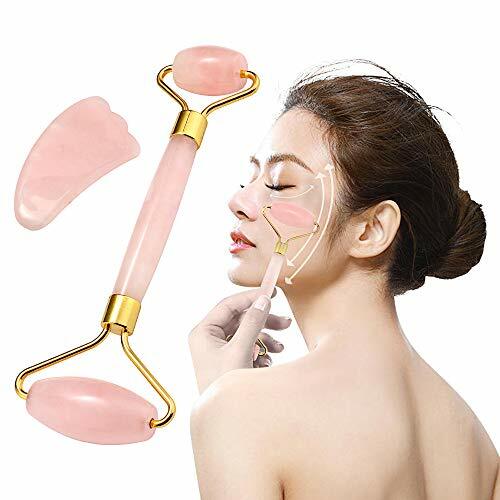 The big roller always massage your face ,neck and small roller suit massage nose, eye and so on.Applying barely any pressure, make you relaxing after work. ►THE BEST GIFT-Whether it\'s birthday or Mother\'s Day or wedding anniversary, whether it\'s for friends or family, the roller must be a perfect gift. ►NOTICE: This item is belonging to Tker. We never authorize others sellers to sell our jade roller. We Received Many Customers\' Complaints Against Other Sellers for Poor Quality. If You Purchase Here and Receive From Other Seller, Please Report To Amazon for \"Item Not As Described\" And Claim for Sell Fake Products And Get FULL REFUND. Before placing an order, please check the shop name \"Tker\" clearly, thanks.